Did you know that honeybees are insects? This means that they have a three-part body and can fly! They have a head, a thorax and an abdomen. The thorax is the middle part and the abdomen is the long torpedo shaped end. Just like humans, bees have some very specialized body parts to do their daily work. Let’s take a look at those parts and what they do! Here are even more parts on a bee! The head is the control center of the bee. It holds the brain of the bee and is also where the nurse bees produce royal jelly, a substance they secrete that makes a normal worker egg become a queen bee! The royal jelly comes out of glands on the top of the worker bee's head. The head also holds the antenna, eyes, and mouth. Can you see all the tiny dots on her eye? Honeybees have two compound eyes. 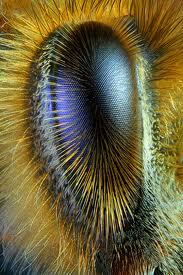 Compound eyes are special because they can see different kinds of light very well, especially UV light from the sun. They also help the bees see colors. They have thousands of tiny lenses to make one big eye. That is pretty amazing! A bee has three simple eyes on her forehead that help her determine how much light there is. A bee uses her antenna to tell how fast she is flying. She also uses them for smelling. Honeybees use smells to tell lots of things, like who to let into the hive and also to communicate with each other. Bees use these to smell things!! 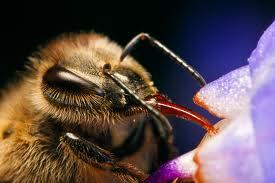 The mandible is a very important part of the bee that allows them to eat food and also is like the honeybee’s hands. The honeybees use them to eat pollen and also to bring pollen to the newly laid eggs. Their jaws are also used to cut and shape the wax in the hive. Did you know that it takes a honeybee about 24 hours after eating lots of honey to start producing wax? The proboscis is a long, straw-like tongue that the bee uses to drink up nectar from flowers. Did you know that honeybees have two stomachs? They have a stomach called their honey stomach that is like a storage bin for the nectar the bees collect. When the bees get back to the hive, they take the nectar from their honey stomach and pass it to one of the other worker bees to find an empty cell to put it in. They also have a stomach for the food they eat that leads to their digestive tract. The forewing is a larger wing that bee uses for flying. Did you know a bee makes a buzzing noise because they can flutter their wings 11,000 times per second? That is really fast! The hindwing is a smaller wing connected to the forewing that the bee can use for cooling off the hive through fanning. Fanning is when a bee flutters her wings very fast but doesn’t move anywhere. It’s kind of like running in place for humans. Honeybee's wings are almost completely see through! A honeybee has six legs and uses them mostly for walking. They can also use them for carrying pollen. Did you know that when a bee lands on a flower they cover themselves with pollen, then they brush their legs down their back to push the pollen into their pollen baskets? Bees comb their hair too! Pollen baskets are sticky hairs on the back legs of the bee that act like backpacks so the bees can carry large amounts of pollen at a time. Can you see the hooks on her stinger? 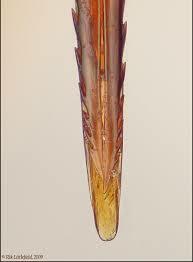 The stinger is a sharp needle-like object used for defense. Only the worker bees and the queen have a stinger. Drone bees don’t have stingers, so they can't protect the hive. The stinger on a worker bee has a hook on it so when she stings, the stinger gets stuck. Then the worker bee will pull so hard her insides actually come out and she will die!